Our bath design consultant understands how to maximize the available space while including a range of features that serve to make your bathroom functional and provide you with a more inviting place to come home to. We know that for many homeowners, the most challenging aspect of a bathroom renovation is identifying a style and selecting the appropriate components—so let Aqua-Tech’s bath design team do that for you! 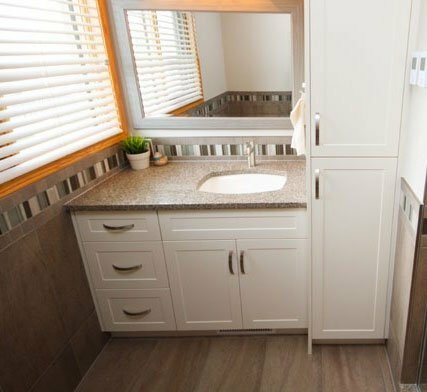 When you’re ready to invest in a new bathroom, you want to be confident that your budget will get you the highest quality components available. We also know how important it is for the pieces you’re selecting complement each other and create a seamless final product regardless of your budget. That’s where working with our interior design team is a huge advantage: by mixing custom features with more budget-friendly options where appropriate, you’ll be able to include features that you never thought possible. Aqua-Tech’s team draws on numerous budget maximizing tactics to provide you with a bathroom that will quickly become your favourite room. With so many styles to choose from, having a design expert working with you throughout the process will help you stay on track and bring your vision to life. From a modern, sleek en-suite with a custom glass steam room, fingertip lighting, temperature, and electronic controls to a classic Jack and Jill family bathroom with double sinks, a generous bathtub and the ample storage that your family needs, Aqua-Tech’s in-house interior designers work closely with you to bring you exactly what you want: the most incredible bathroom possible. 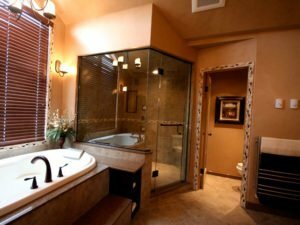 Our bath design consultant will put your budget to work for you, helping you plan your dream renovation while reducing the stress normally associated with a remodel of this type. Their knowledge of the custom design possibilities, trends and available products is unmatched in Winnipeg. And you get their support for the duration of the project completely free of charge. There’s never been a better time to finally get the perfect bathroom you’ve always wanted. Let our team help you achieve your dreams. Call today to meet the team and discover how we will bring your ideas to life.